GolfAhoy has a group of adventurous golfers in September every year challenging the golf courses along the Danube River in Europe aboard an AmaWaterways luxury riverboat, visiting Austria, the Czech Republic, Germany, Hungary, and Slovakia en route. 2020 Danube River Golf Cruise AmaWaterways AmaStella Balcony Stateroom exclusive GolfAhoy offer! 2020 Danube River Golf Cruise AmaWaterways AmaStella with Twin Balcony Stateroom | 5 golf rounds – exclusive GolfAhoy offer! AmaStella | Starts September 3, 2020, in Prague (w\3 days pre-cruise hotel & golf pkg.) to Budapest (w\2 days post cruise hotel & golf pkg.) trip ends in Budapest. 7 Day Romantic Danube River Cruise Vilshofen to Budapest + Golf at Beckenbauer GC; Diamond GC; Penati Resorts GC. 2 Nights Post-Cruise Budapest Sofitel Hotel + Golf at Pannonia GC. Prague – This morning, choose between a standard city tour and a hike. Both will reveal why Prague is considered one of Europe’s most attractive cities, with a historic city center that’s recognized as a UNESCO World Heritage Site. You will see Rudolfinum, the National Museum, Wenceslas Square and the Hundertwasser Dancing House. Next, visit the 1,000-year-old Prague Castle and St. Vitus before walking over the romantic Charles Bridge to the Old Market Square, where you will find the capital’s famous Astronomical Clock, Tyn Church and the statue of Jan Husek. The rest of the day is at your leisure, perhaps to enjoy yourself in one of the city’s many charming cafés. For non-golfer travel-companions see all optional City Tours. Vienna optional choice add-on. A 6th round could be incorporated in Vienna at Adamstal GC, ranked 85th in Europe and truly a magnificent course showing the true beauty of the alpine nature around Vienna. Ask your GolfAhoy agent to reserve at the time of booking. Golf courses are subject to change without notice. This beautifully designed golf course owes its origins to the dreadful Chernobyl nuclear disaster in May 1986. The exceptional 18-hole championship course along the Dragon Lake offers mountain peak views of the Salzkammergut. In the years prior to the Chernobyl nuclear disaster, Peter Graf raised a prime bull breed on the acreage that is now the Golf Club Mondsee. Meat prices fell drastically after Chernobyl in Europe, so the Graf family sold off their herd and started looking for a different use for the land. For a family of golfers, the decision was easy, build an 18-hole championship golf course. A valid handicap certificate or card is required. Handicap limit is 54. The play is limited to 4½ hours. The demanding, yet fair course with its many bunkers and water hazards is one of Austria’s top golf courses. The 18-hole Championship Course was a venue of the European Tour in Austria from 2006 to 2009 and 2015 venue candidate for the Ryder Cup 2022. The course is situated about 5km from the capital of Slovakia – Bratislava. This masterfully designed 18-hole Black River golf course is, thanks to its rating, one of the most demanding courses in Europe. The first six holes are a part of the original course, called Park, they are situated in a park of a baroque mansion, and the other holes are situated behind river Čierná voda. The most difficult hole is number 12 which has a double dogleg. There are large bunkers in the first break making placing the ball in a good position for the next hit difficult. In the second one, there is a water hazard leading to the green. It is difficult to choose the most interesting holes because each of them, at this course, has all of the attributes which a challenging golf course can offer to golfers. A valid handicap certificate or card is required. Handicap limit is 54. Budapest. Your morning excursion includes sightseeing in the cities of Buda and Pest spread over both banks of the river. You will see famed Heroes’ Square and Castle Hill, home to Fisherman’s Bastion, Matthias Church and spectacular views of the Danube. Alternatively, you may also opt to join a hike up to Castle Hill on which you will see Buda Castle, Fisherman’s Bastion and Parliament Square. After dinner, the ship will sail a special Illuminations Cruise past the glittering river front of Budapest. The club is situated in Máriavölgy, approximately 30 – 40 minutes from the Budapest city center. The land was occupied by the Habsburg family as a weekend retreat around 1845. The approach to the clubhouse leads through a gorgeous row of 200-year-old Sycamore trees. The 18-hole championship course was designed by renowned architect, Hans-Georg Erhardt and was opened in 1997. Pannonia Golf & Country Club is proud to have hosted the 2011 and 2012 Hungarian Open Amateur Championship. A valid handicap certificate or card is required. Handicap limit is 36. For non-golfer travel, companions see optional City Tours. In some instances, GolfAhoy golf-excursion times will conflict with AmaWaterways organized walking city tours or excursions. Where GolfAhoy golf group guests forfeit Ama tours for golf excursions the price of the GolfAhoy golf package is already adjusted for any forfeited Ama walking tours or excursions. Economy Golf Course Shore Excursion ITINERARY – Ports subject to change per river conditions Danube River Golf Cruise. 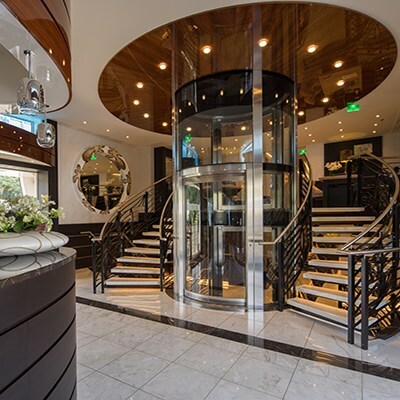 AmaStella is the epitome of the first-class luxurious amenities and comfortable public areas that are being added to the new breed of European riverboats. With a pool and whirlpool, Bistro, main lounge, bar, and wine bar, gift shop, library, Spa and hair salon, fitness room, Chef’s Table restaurant, and Main restaurant – there are no shortages of après golf 19th hole libation locations to be found aboard this beautiful new riverboat. Dinners are prepared under the watchful eyes of a European Champion of Culinary Art, three times gold medal winner, Chef Primus Perchtold. AMA is the only river cruise line to have been inducted into La Chaine des Rotisseurs, the world’s most prestigious culinary organization. Past passenger testimonials say that the food is absolutely fantastic, service is European smart hospitable and presentation execution is creatively stunning. 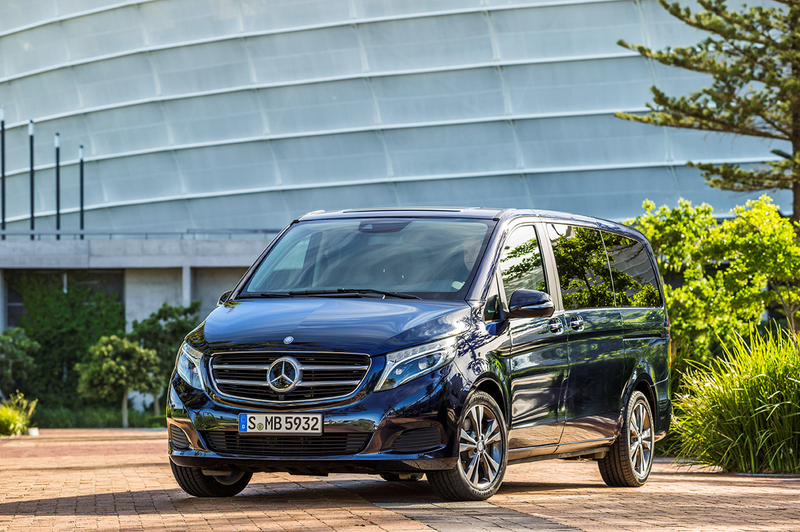 Supreme comfort and convenience make it the premier way to experience magnificent cities, historic villages and little-seen enclaves. From your stateroom balcony, endless natural beauty combines with evolving views of the colorful local scenery. Castles and fortresses tower on both sides as if you could reach out and touch them. When your ship docks in the heart of town, stroll ashore for included excursions or set off to explore on a complimentary bicycle. With no need to navigate from place to place, you’ll find a sense of adventure and a sense of home all in one vacation. Unpack once and get comfortable. Visit different cities and countries while your hotel travels with you. A river cruise offers the amenities of a first-class hotel from which you’ll never feel uprooted. Discover local delights on shore then return to your large, stylish stateroom. 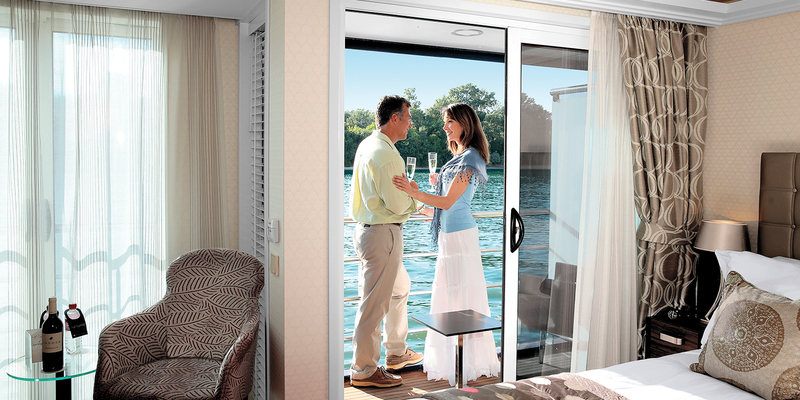 Watch the scenery slip by from your balcony as you leisurely sail to your next destination. Dock right in the heart of historic cities. Enjoy the excitement of waking up in a new town, docked just steps from markets, museums and landmarks. Ships rest close to the town center so you can easily sample local culture and favorite pastimes. Simply walk off the ship and into the heart of the city. Take a guided excursion or instantly blend in with daily life. Discover the world’s most scenic waterways. Cruise through some of Europe’s oldest cities or on the world’s most scenic waterways. These were the original highways between great cities built along the water’s edge. Over the course of your journey, you’ll find yourself surrounded by rolling vineyards, hilltop castles, and time-honored cities and challenging championship golf courses. Intimate environment and an inclusive value! With river vessels accommodating a mere 150 passengers, you will never wait in a long line to board or disembark. Smaller tours and intimate meal settings with open seating create a warm, personal atmosphere accentuated by five-star service. 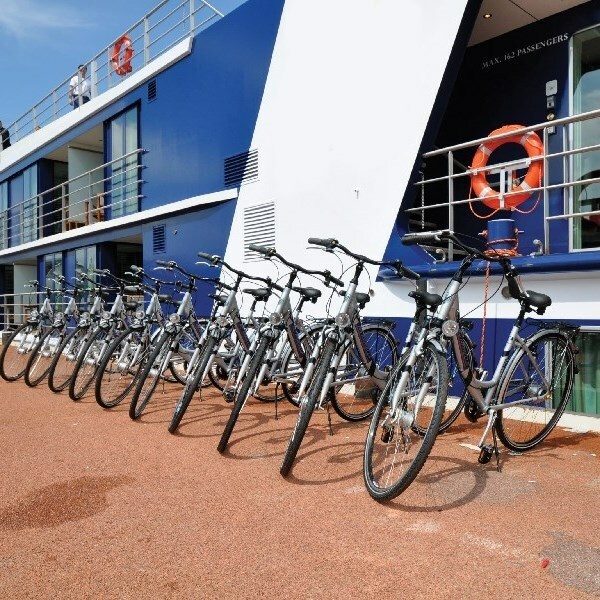 Your inclusive vacation provides incredible value for the champagne breakfast and free-flowing hand-selected European wines with lunch and dinner to a fleet of bicycles, free Internet access, included sightseeing excursions and live cultural entertainment onboard. On a river cruise, your vacation’s price tag doesn’t keep adding up. Danube River Golf Cruise AmaWaterways AmaStella. AmaWaterways river cruise ships are inspired by luxury yachts and designed specifically to maximize every aspect of the guests’ experience. You will notice the difference the minute you step on board and are welcomed in the beautiful lobby. From then on, you will be treated to an array of unique and luxurious features as you journey along in your floating hotel. Relax and delight in stunning views in our spacious staterooms, many of which feature twin balconies — a French balcony and an outside balcony. Enjoy exclusive amenities like massage services, a fitness room, and a pool while on board. Indulge in award-winning cuisine at a variety of dining venues, including The Chef’s Table specialty restaurant — an experience you won’t find elsewhere. 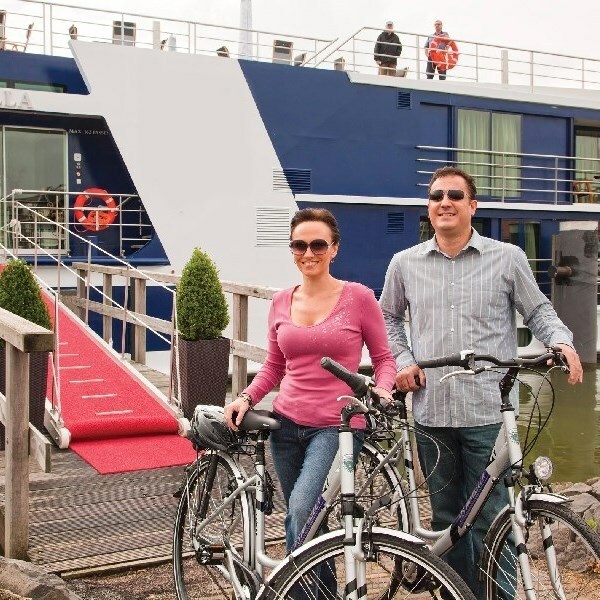 Berlitz rated AmaWaterways ships the highest in its definitive guide to river cruising in Europe. Known for its international travel and language expertise, Berlitz has published cruise guides for 30 years. Author Douglas Ward, a leading authority on cruising, has over 40 years of experience and has spent more than 6,000 days on board covering more than 1,000 voyages. 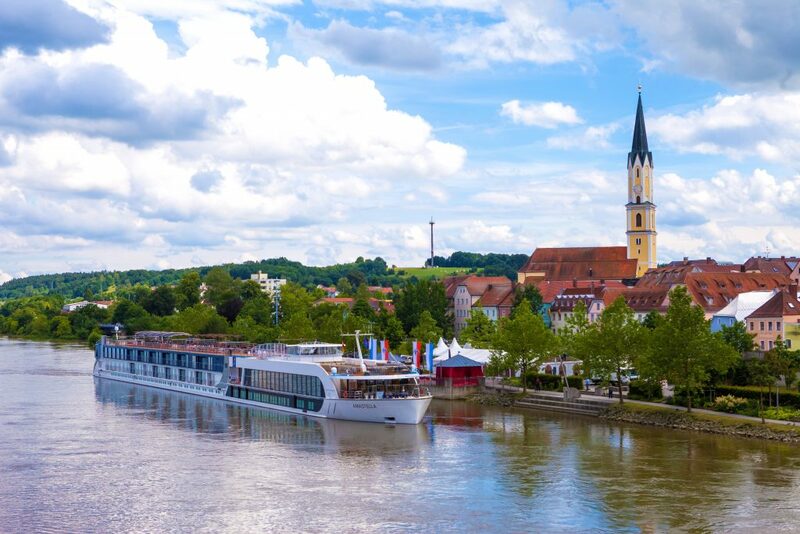 Out of the more than 280 river cruise vessels that were reviewed based on accommodations, dining, service, and other onboard features, Ama took the top 11 spots in the rankings.